We are free to worship God openly with local believers. 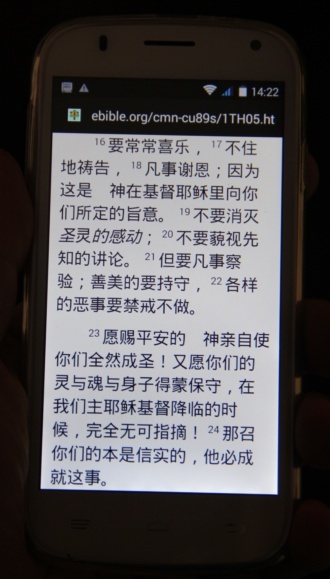 We are free to read the Holy Bible in our own language. We are free to share the Holy Bible with many other people in many languages. People pray for us and support us. We have friends and family who love us. More hearts opening up to the idea of Scripture publishing as ministry instead of for-profit business. Nate is coming back for Thanksgiving. ...and much more. God is good! What are you thankful for, today? 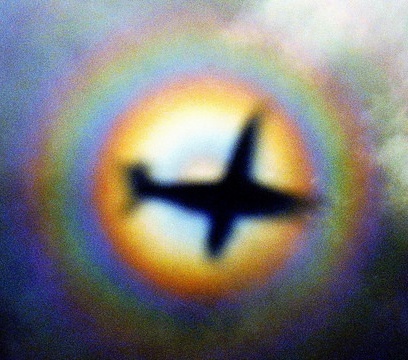 This is a picture of a diffraction rainbow around the shadow of the airplane that Lori flew in to the Big Island. She was a guest speaker at the International Primary Health Care school at the University of the Nations Kona Campus. These concentrating solar collectors at the University of the Nations Kona campus caught my attention during our last visit, mostly for what they were not doing. They weren't tracking the sun. Instead of producing electricity, they were just standing there, like works of art, offering a lesson to those who care to learn. Much of what I do in writing Bible publishing software is like in that my first idea doesn't always work exactly as planned. I write a program to do something and test it. If it works, great! If not, I figure out why, fix it, and try again. Sometimes it takes several cycles to get something right, but perserverance pays off. It takes many people to make something like a solar energy project work. It also takes many people to get the Word of God to a new language group. Thank you for persevering with us in prayer and financial support and as God leads you, and being a part of the team getting the Word of God to people in the languages and formats that best serve them.